Openness isn’t just for infant adoption anymore. Even in the absence of contact with birth parents, openness can help parents connect with and be more accessible to their kids and help them grow up whole. 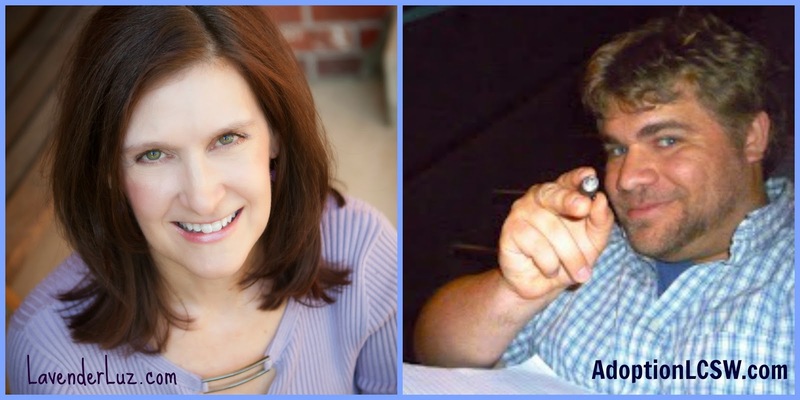 In this interview, adoption movie critic Addison Cooper (AdoptionLCSW.com) interviews Lori Holden (LavenderLuz.com), author of the 2013 book, The Open-Hearted Way to Open Adoption: Helping Your Kids Grow Up Whole Part 1 of a 3 part interview is shared here today. Giveaway: We're giving away three hardback copies of Lori's book, The Open-Hearted Way to Open Adoption: Helping Your Kids Grow Up Whole (cover price $29.95), one for each day of the interview. To enter, just sign up for Adoption at the Movies' free email subscription OR leave a comment below sharing some adoption blogs that have been helpful in your journey. Addison will pick all three winners at random on Saturday, April 11. Also check out Part 2: Dealing with Common Fears about Openness in Adoption Part 3: Dealing with Adoption's Ghost Kingdom Part 1: What to do When Triggered By the Online Adoption Community ADDISON: Your book just had its 2nd birthday last week, and your two kids are now in their early teen years. What have you learned about adoptive parenting since your book came out, and would these new development have changed your book? LORI: I’m realizing that if a child is going to have issues around his/her adoption (some will, some won’t –the determining factors are an unpredictable mix of nature and nurture) these issues will likely be there whether or not you have openness. By “openness” I mean not only possible contact, but also the way we parent, how open and vulnerable we make ourselves to our child. As you know, I have separated those two measures of contact and openness. It’s only partly true when you say you’re in an “open adoption” because you have identifying information and/or contact with birth family. Openness also refers to the degree to which you’re open to your child when she comes to you with questions, and how open you can be when responding in those moments. If I were to update The Open-Hearted Way to Open Adoption: Helping Your Child Grow Up Whole, I would be more in tune with the notion that for some kids (not all), there may be issues that stem from the adoption itself, no matter how much openness there is. Openness prepares the family to deal better with the issues that arise, but it doesn’t solve or prevent all issues. Openness is better than closed, but adoption can still be really rough at times. ADDISON: That’s realistic, I would say. There’s no magic wand that makes anything completely easy or completely hard, but one’s preferable to the other. In your book, it sounded like the online adoption blogging community had been very helpful to you, and in fact, lots of adoption bloggers lent their voices to your book. How did you decide to start blogging, and how can the online community affect families touched by adoption? It can seem brutal at times. LORI: I started blogging because I read an infertility book, a memoir called Waiting for Daisy by Peggy Orenstein in the Spring of 2007. When I finished reading the book, I wanted to learn more about the author, so I Googled her and one of the first links that came up was to a blog called Stirrup Queens. Melissa Ford, the blogger, had just launched a book tour about Waiting for Daisy, and in the post announcing it she said, “all you need is the book and a blog.” I thought, “Well, I have the book, and I can create a blog.” So, I created a blog. As for how the online community can affect families involved in adoption, at times it can be very supportive and other times, as you say, brutal! It’s an act of self-preservation to develop healthy boundaries when interacting online -- to know when something’s not about you, and to not engage when something’s not about you. And when something IS about you, to be open to exploring how it is about you without becoming triggered or reactive. ADDISON: What are some strategies to avoid taking things personally that aren’t personal, and avoid becoming unhelpfully over-reactive? LORI: The image that I have is of the doctor checking you out with one of those reflex hammers, which she uses to tap you right below your kneecap. You don’t think about reacting, you just automatically kick – the original knee-jerk reaction. Sometimes what we see with online comments are knee-jerk reactions, where people react instead of respond. Information and processing isn’t going on in the higher levels of the brain, but rather we give a more visceral, un-thoughtful reaction – which is very different from a considered and chosen response. When you find this happening to you, stop and breathe. Breathing is always there for you, and it’s the thing that takes you back into your thinking mind. Breathing helps you realize, “I can tell by my reaction there’s something here for me. Why did I get triggered by this?” Such introspection can help you see into your own psyche – and begin to heal your own wounds. This wouldn’t trigger me if I weren’t afraid it was true. If you’re triggered by something you’re reading online, there’s probably something in you that needs to be dealt with -- and not just in the other person. For example, if somebody tells me that I have stinky hair, and I don’t have stinky hair, I’m not going to respond to it because it doesn’t make my knee jerk. But if someone tells me, “You don’t spend enough time with your kids,” I may feel like lashing out at the person who dared to point that out. Deep down, I do feel guilty for not spending more time with my kids and for being on the computer. Maybe I should be interacting more with my children, but HOW DARE YOU TELL ME. And I WILL MAKE YOU PAY FOR DOING SO! ADDISON: It sounds like the stuff that resonates within us either matches something we know to be true about ourselves, or something that we fear to be true about ourselves. LORI: Exactly right. When your child says, “You’re not my real mom” -- if you’ve already worked that through within yourself, then that is not going to stick to you. You’ll be able to say, “I understand that you feel that way, but I’m here and you’re stuck with me and I’m never going away” -- instead of deflecting the child’s feelings saying something defensive like, “I have a legal document TELLING YOU I’m your real mom!” You can address your child’s feelings better when you’re not triggered. When I examine myself and realize that I DO spend time on the computer, but I also talk with my kids a lot and am present for them, I have neutralized the fear and the accusation won’t stick to me. Or, maybe when I evaluate myself I find that something I read online DOES stick to me, it can serve as a call to rebalance where my attention goes. It’s important to think about the things that we react to, and look behind the feelings. That’s what the breathing does. It gives me that pause, that bit of space to turn a reaction into a response. Giveaway: Enjoying this three-day interview series? Want even more insight into open adoption? 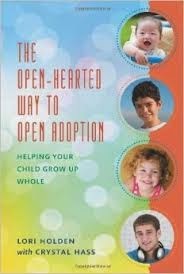 We're giving away three hardback copies of Lori's book, The Open-Hearted Way to Open Adoption: Helping Your Kids Grow Up Whole (cover price $29.95), one for each day of the interview. To enter, just sign up for Adoption at the Movies' free email subscription OR leave a comment below sharing which adoption blogs have been helpful to you. Addison will pick all three winners at random on Saturday, April 11.